Surfing grows in popularity every year. This results in a wide range of crafts on the water from body boards to surf boards to surf kayaks to wave skis. 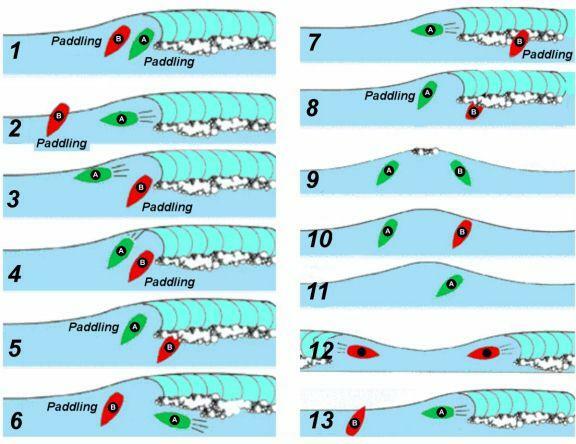 Due to this it is vital to know and understand good surfing etiquette. This will ensure you have a fun and safe session. Surf Etiquette – Know your limits and be aware of those around you for a happier day in the surf. 1. GREEN is closest to the breaking wave has possession. 3. GREEN is already surfing so RED has a late take off and may not surf. 5. RED is attempting a soup take off but GREEN has caught the wave on the face and has right of way. 9. Both RED & GREEN may surf from one peak if they go opposite directions and their paths do not cross. 12. Neither surfers has right of way in a collision situation. 13. GREEN has right of way but may not hit RED. Under contest rules RED may be called for interference if RED impedes GREEN’S progress.